Dark sky photography is a fascinating challenge for me. 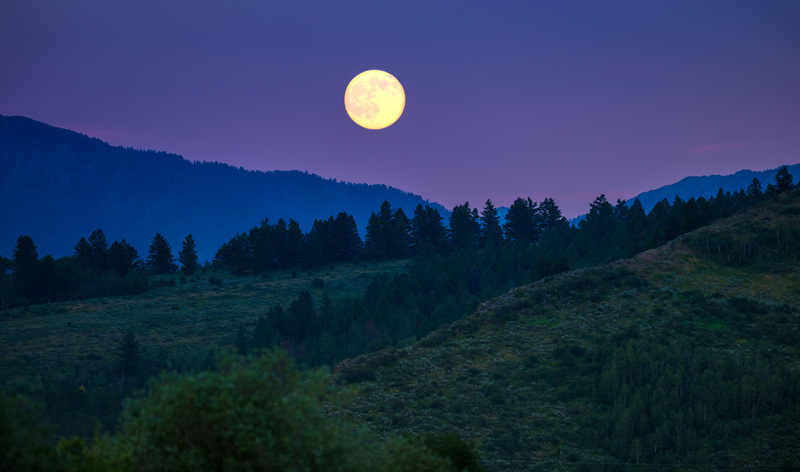 Cameras and software continue to improve in ways that make photos of a full moon rising over the landscape more than a bright light and a silhouette. One important factor is that the night before the full moon, and the night of the full moon, the sun sets right about the same time….so it provides some light, and maybe some color, for the landscape. Shooting pictures of stars…and the ultimate: the Milky Way…requires one major thing that is harder to find than you think. Darkness. I mean really, really dark skies. 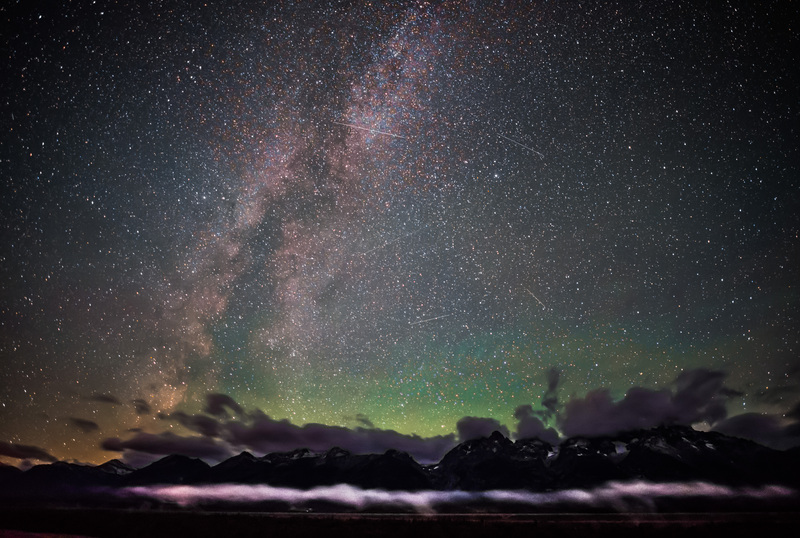 Even a city 50 miles away can produce so much ambient light that it blows a great Milky Way shot. But the moon is also a torch in the sky that will prevent a decent Milky Way photo. Life is full of compromises, and so are many of my daily shoots. I can’t bring the family 70 miles from the coach just any old time of day or night, nor can they just sit in the car in the dark for hours while I wait for exactly the right circumstance to trigger the shutter. But Robyn is always up for a good adventure, and Ross & Ryan are more cooperative about getting up in the middle of the night once in a while than you’d expect! So when I wanted to get a Milky Way photo above the Teton mountains, and suggested we get up at 2 am and make the 90-minute drive to the park, they were all agreeable! The shutter went *click* on this one at 4:20 am. It was 28 degrees outside. I would say you succeeded. You are one AWESOME photographer!!!!!! That’s very kind, Judy, thank you. I’m so grateful for the awesome world God gave us…to see and to photograph! Worth it, worth it, worth it, in my humble opinion. Furthermore, I wasn’t one having to rise at that unearthly hour! All your friend in Ohio has to say is ( “WOW” ) Glad – they were all agreeable! Amen…amazing how all these celestial bodies run like clockwork! Almost miraculous, eh? That is totally a money shot if I ever saw one! Perfect. Thanks to R, R, and R for letting you try this, but now you all need to be rewarded by having this photo appear in National Geographic. Much of the National Geographic award criteria go to the the story behind the photo and the circumstances, which is why your story you told here will help this photo get published in their magazine. Ya think, Ken? Okay, just send small, unmarked bills in a plain envelope…. But seriously, thank you from the bottom of my heart. I was pleased with the result…but could see where some useful tweaks could be made next time! I’m waaaay early in the learning curve on this night photo stuff…it’s not as obvious or intuitive as conventional landscape photos. Stay tuned! Wow, thanks for that, Tom!